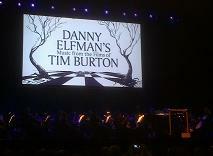 The composer Danny Elfman has long been associated with the films of director Tim Burton. The two almost launched their careers together with "Pee-wee's Big Adventure" back in 1985. Twenty-Seven years later in 2012 the pair worked together again on the animation "Frankenweenie". In total they have collaborated on 15 films to date over those 27 years, with both men highly recognised in the industry for their unique contributions to film. This series of concerts celebrates that most fruitful of collaborations with a focus on the music of Danny Elfman. The concert series started in the Royal Albert Hall in London (home of the "Proms" concerts), and moved to various cities throughout the UK. 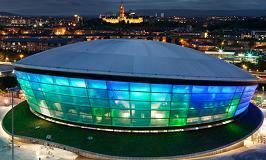 The only Scottish date for the concert was in Glasgow on 9th October at a brand new venue, the SSE Hydro. The Hydro is the largest arena in Scotland, situated among the complex of buildings beside the Scottish Exhibition and Conference Centre. It can accommodate up to 16,000 people or 12,000 all seated, and aims to attract big acts to the country. The hall opened earlier in October hosting Rod Stewart in concert, but it has suffered from some set-backs. A fire in 2013 caused by welding work delayed the opening, and a suspected gas leak earlier in the day even threatened the Danny Elfman concert but thankfully the impact was only a one-hour delay. Danny Elfman was the first orchestral concert to be held at the venue, and the Hydro is designed so that the upper reaches of the stadium can be curtained off for smaller events. Unlike most orchestral concerts this one made extensive use of microphones and amplification. In part this was surely to convey Danny Elfman's unique recorded film sound which regularly brings to the fore relatively quiet solo instruments together with full orchestral sections. Sound mixing like this on live concerts must be something of a nightmare for those involved, particularly when moving from one concert hall to another on successive days with differences in layout and accoustics. There were some minor anomalies - the choir seemed a little quiet on some tracks, the tuba occasionally sounded too loud, and the piano solos had a noticeable echo effect on Corpse Bride - but on the whole the system worked very well indeed. The resulting sound was similar to many film scores in that the overall impression was similar to applying audio compression, with a narrower dynamic range raising the volume of quieter passages. Above and behind the orchestra was a large screen, and this was used to project film clips and images of Tim Burton's original character sketches for the films. The film director has always had a distinctive visual flare, often based on characters sketched many years before they appeared in his films. The dark, quirky and sometimes comic nature of these drawings and films have clearly provided the inspiration for Elfman's equally dark, quirky and fun music, so it seems only right to showcase the two together. However this was often for only the first 2 or 3 minutes of a musical piece, after which the audience were able to focus solely on the music. Conducting a show like this is a demanding task requiring skills beyond those normally expected of a conductor, but John Mauceri brings a wealth of experience to the role. He addressed the audience on several occasions, helping to set the scene and contibuting to the overall atmosphere with his relaxed manner, gentle humour and encouragement of participation. Mauceri introduced one particular instrument the Theremin, asking the Lydia Kavina to demonstrate how the distance of her hands from the two antennae controlled the pitch and volume of the sound - particularly suitable for otherworldly sounds such as in "Mars Attacks!". The Theremin is a difficult instrument to play accurately and Kavina is one of the world's most experienced players. There is a photo of her demonstrating the instrument in our article about Electronic Music. 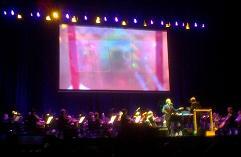 Technically the conductor had to synchronise sometimes to film segments, using earphones (presumably with a click track) and graphics on the screen in front of him, and sometimes he conducted the music in a pure way with a freer tempo. 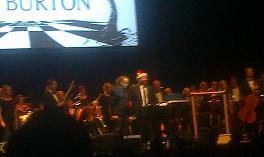 John Mauceri even played the role of Santa Claus (complete with hat) to Danny Elfman's Oogie Boogie for the encore. The music itself consisted of new film suites arranged by Elfman, piecing together memorable tracks and sections of the film scores into extended segments conveying key moments from the films. The first half of the concert included music from Elfman's first two Tim Burton films "Pee-Wee's Big Adventure" and "Beetlejuice", the latter introducing the Maida Vale Singers singing "Day-O" the Jamaican Banana Boat Song sung by Harry Belafonte on the original soundtrack. The first half of the concert ended with a continuous sequence of tracks from "Batman" and "Batman Returns", the films which firmly established director and composer in Hollywood's A-List. The "Descent into Mystery" segence, which never fails to raise hairs on the back of the neck, was a particular highlight and synchronised to picture. The second half started off with the bombastic music for "Planet of the Apes". The conductor's earphones suggested that the unusual percussion instruments had been previously recorded to be synchronised by the orchestra. The second half featured two of Tim Burton's animated features, "Corpse Bride" and 2012's "Frankenweenie" which brought back the theremin and another synchronised film sequence. The concert so far was great by any standards but the show ended with a magnificent climax. 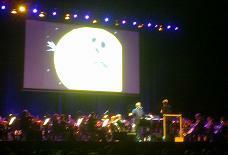 After the familiar dreamy music of "Edward Scissorhands" (complete with the busy haircutting scene with leader Charles Mutter playing the violin solos) Danny Elfman himself took the stage to sing several of Jack Skellington's songs from "The Nightmare Before Christmas". Elfman voiced the stop-motion character in the original film, and on-stage he clearly inhabited the character with lots of body movements and facial expressions. When he sang "What's This?" synchronised to the film, it was almost as though they had used motion capture to animate Jack. 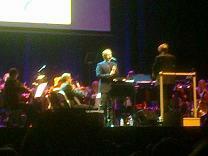 After a standing ovation, Elfman left the stage to be replaced by the Boy Soprano Harry Jackson who sang "Alice". Burton's film version of "Alice in Wonderland" used a purely instrumental soundtrack but Elfman included a choral version of the title song on the soundtrack album. Harry Jackson seemed completely undaunted by the situation singing an extended version of "Alice" to round off the concert on a high. Danny Elfman then returned for a single encore, bringing the house down with the Oogie Boogie song from "Tim Burton's The Nightmare Before Christmas". This is one of the most memorable concerts of film music you will find. It comes very highly recommended if you get the chance to see it!